Vital Remnants: #TimKaine signed the same religious freedom bill as Pence. So where's the outrage? #TimKaine signed the same religious freedom bill as Pence. So where's the outrage? Remember the public meltdown among the Tolerance and Diversity crowd over Mike Pence signing an Indiana law that simply underscored the traditional protections religious people have enjoyed under the First Amendment's religious exercise clause? Well, it turns out that Tim Kaine signed virtually the same law on Virginia in March of 2007. The media has repeatedly brought the Indiana law up as justification for criticizing Pence as the Republican's vice presidential candidate. 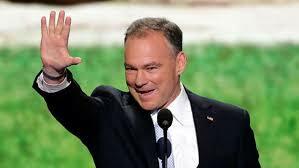 So why isn't Kaine criticizable for the same reason--particularly since he is the running mate for the liberal candidate for president ("liberal" being defined as the political faction which stands for progressivist values, but only when the political winds are blowing the right way). As far as I can tell there has been no national coverage of this fact, which means either that the media doesn't know it yet, or that they know it and are giving Kaine a pass. Is Mike Pence really a "principled conservative"?